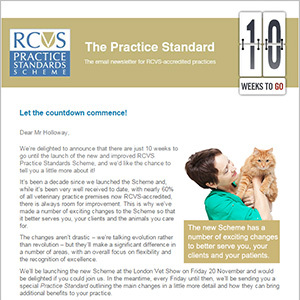 We launched the revised Practice Standards Scheme at the London Vet Show on 20 November 2015. Launch day - A very warm welcome to your new PSS! 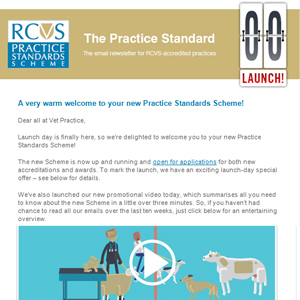 Our promotional video summarises all you need to know about the new Scheme in little over three minutes. Click on the link in the email for an entertaining overview. 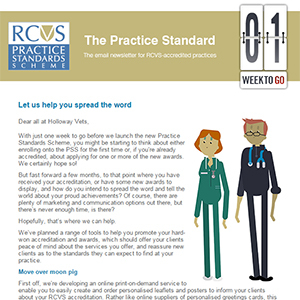 Gaining RCVS-accreditation is hard enough work as it is, so here's how we plan to help practices promote their accreditation and awards to their clients and the wider public. 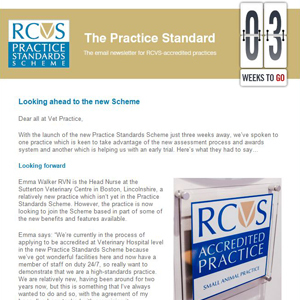 We hear from two different practices this week: one that's keen to join the new scheme, and one that's helping us to trial the new scheme and the awards. 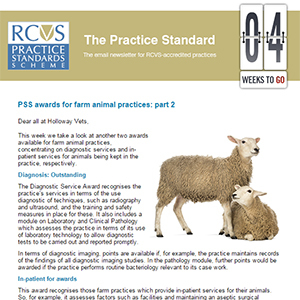 A second more in-depth look at awards for farm animal practices, featuring: In-patient Service and Diagnostic Service. 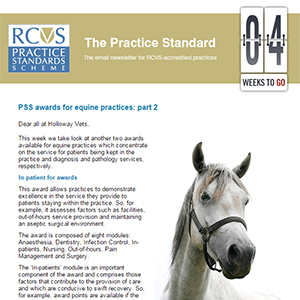 A second more in-depth look at awards for equine practices, featuring: In-patient Service and Diagnostic Service. 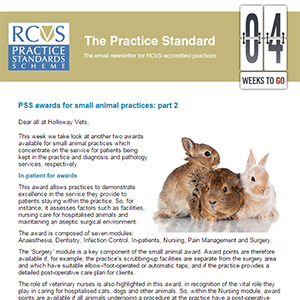 A second more in-depth look at awards for small animal practices, featuring: In-patient Service and Diagnostic Service. 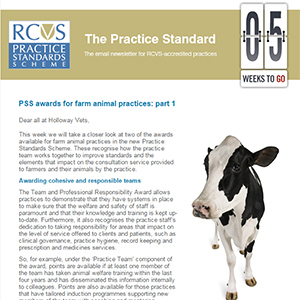 A first more in-depth look at awards for farm animal practices, featuring: Team and Professional Responsibility and Advisory/Consultation Service. 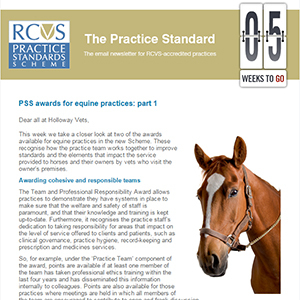 A first more in-depth look at awards for equine practices, featuring: Team and Professional Responsibility and Patient Consultation Service. 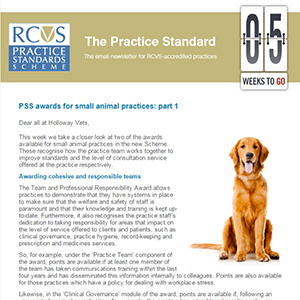 A first more in-depth look at awards for small animal practices, featuring: Team and Professional Responsibility and Patient Consultation Service. 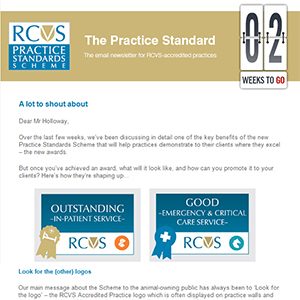 Here's an overview of the new awards, which are available at either 'Good' or 'Outstanding' level across a variety of different areas. Seven weeks to go - Say hello to Stanley! 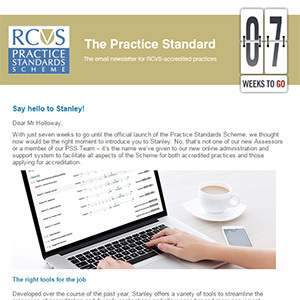 Stanley is the name we've given to our new online administration and support tool to help practices with their accreditation and awards applications. 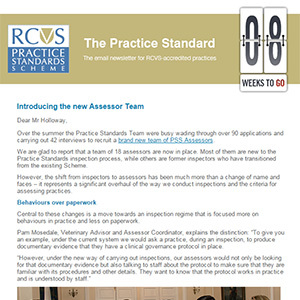 Our team of newly-appointed assessors will focus more on behaviours and outcomes, and less on paperwork. They're also receiving intensive training to help deliver a better experience to practices. 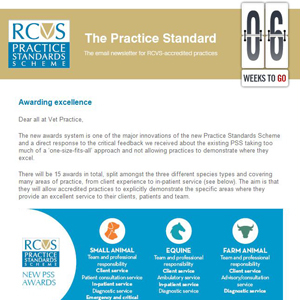 A flexible scheme for practices of all types, shapes and sizes, especially with our new awards! Ten weeks to go - Let the countdown commence! 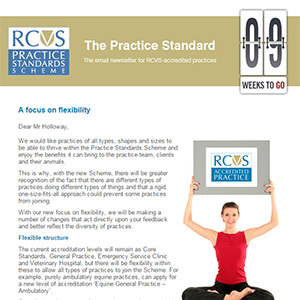 Read an overview of the new Scheme, why it's needed and what's changing.